The WoodSongs Dalton 2019 Concert Series will host the award winning singer-songwriter Donna Ulisse with the Poor Mountain Boys and Spatial Effects at 7 p.m. on Saturday, Jan. 26 at The Wink Theater, 115 Crawford St. in downtown Dalton. Opening for Donna will be Spatial Effects, a regional band that plays a mix of bluegrass, gospel, and their “slightly bent” originals. "The unique musical fare of Spatial Effects sets them apart from traditional bluegrass bands. The recipe for their brand of bluegrass music includes several degrees in music, creativity, some award winning songwriters and a sometimes off the wall sense of humor," organizers said. The January concert will also honor the Girl Scouts of America in Northwest Georgia. Girls Scouts will be admitted to the concert free if wearing their sash or vest. Advance tickets for the January concert are available at the Dalton Freight Depot Gift Shop, Bigham Discount Music, online at www.woodsongsdalton.com and at the door. Advance tickets are $18 and $22 at the door. Donna is no stranger to Dalton, having performed here several times in the past. Country music fans remember Donna Ulisse from her days when she was signed to Atlantic Records in the early 1990’s where she released a critically acclaimed album Trouble at The Door with three singles and two videos. She was also a guest on many national television shows including Hee Haw, Nashville Now, Crook and Chase and NBC’s Hot Country Nights. 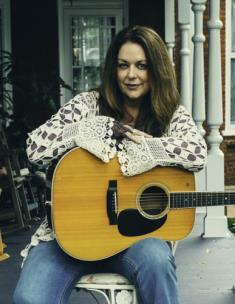 These days Donna Ulisse is a key figure in the bluegrass, folk and acoustic music scene as a singer and songwriter. Her past albums have charted prominently in the Bluegrass Unlimited charts, The Folk DJ National chart, The Americana Music Charts and Billboard Bluegrass chart. while her 2012 Christmas album All The Way To Bethlehem was called “a masterpiece” by Kyle Cantrell, host of Bluegrass Junction on SiriusXM Satellite Radio. Edward Morris, writer for CMT.com dubs her “one of the most commanding voices in bluegrass music.”She also won the award for 2016 International Bluegrass Music Association’s Songwriter of the Year and 2018 SPBGMA Songwriter of the Year Award. Donna’s songs have been recorded by bluegrass artists Claire Lynch, Darin and Brooke Aldridge, The Bankesters, Doyle Lawson, Larry Stephenson Band, and Volume Five to name a few, as well as a song on the 2014 Grammy winning album Streets of Baltimore by the Del McCoury Band. In 2017 she was the winner of IBMA Song of the Year for the song “I Am A Drifter” recorded by Volume Five.